This weeks prompt was chosen by our feature artist today, Dani Choate. It’s a quote by Neil Gaiman and it’s all about being brave enough to keep moving FORWARD, not letting perfectionism get the better of us and not being afraid to make mistakes especially in our art! So let’s all get out there and make some big wonderful mistakes along our journey and see just where it takes us! Don’t be afraid to make a mistake on your page! I chose this weeks inspiration page as it was one that challenged me. I don’t like my handwriting and I’m always worried that I’ll ruin a page that I otherwise love once I write on it! This page was inspired by an online class with Donna Downey. I took a deep breath and went crazy with my fineline paint applicator and I actually love how it turned out in the end. 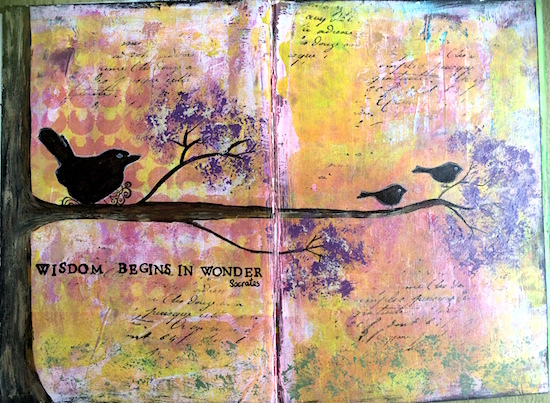 Dani Choate is a mixed media artist and art journaler from Sydney. After studying Graphic Design in the early 90s she spent the next 12 years immersed in the Natural Health and Alternative Therapies industries. When her children were small she was inspired once again to return to art making. These were adventures in soft toy design, zine editions, lino & gocco printing, ATC & ACEOs, book page line art and a hobby turn at children’s fabric design. 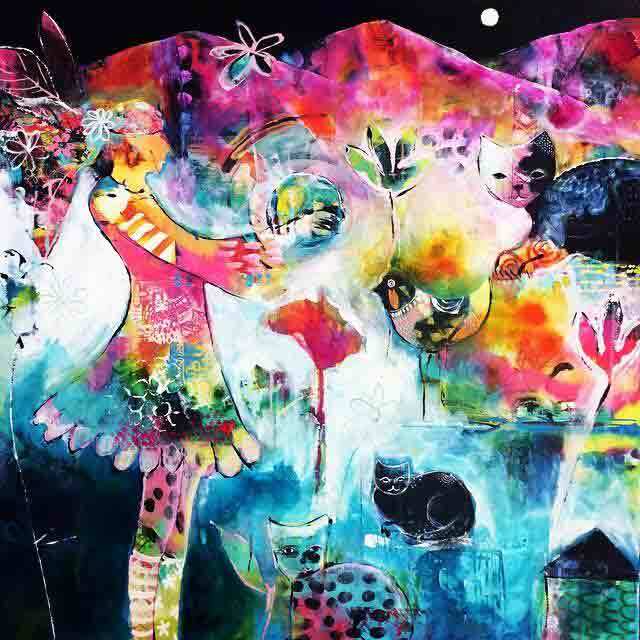 Her current work is most often whimsical, feminine and full of colour & pattern. 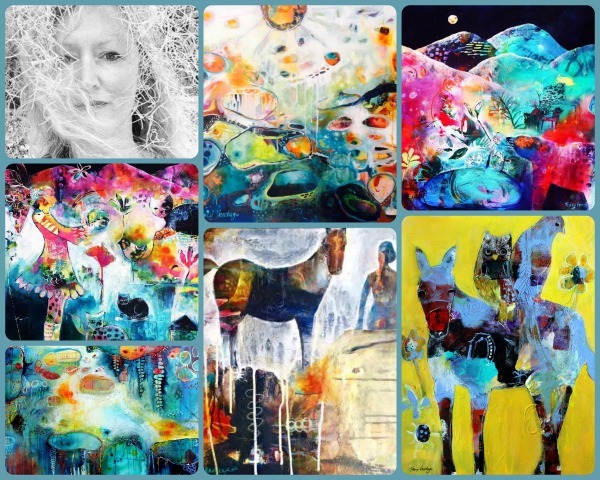 She displays a playful, childlike quality within each of her pieces. As a younger person I was encouraged to approach the world from a perfectionist standpoint. I grew up in a family where art and art making was given little importance and doing what you were good at was valued over doing what you loved. In my experience, this perfectionist standpoint makes it very difficult to ever begin the process of art making. If you begin to create something, with an attachment to a specific outcome, you give no room for error, no room for exploration, no room for mistakes. Yet, as I am beginning to understand, mistakes are important, mistakes are our teachers, mistakes are in fact, vital. Mistakes allow you to observe yourself and your responses and to explore your capabilities. Mistakes give you the gift of being able to discover your new ‘edges’ and have faith that abilities that you didn’t even know yet existed will always be ENOUGH. Embrace the mistakes that you may make within your art. They are the teachers that we can rely upon to guide us along our way. Music, art, colour, pattern, numbers … road trips, op-shops, vintage paper, old handwriting … disconnecting from the everyday, anything unusual, eccentric, hidden or extraordinary… my girls. For this week’s challenge prize Dani has generously donated this A4 edge to edge giclee print of “Breeze” printed with Epson Archival inks using Canson Infinity paper, Epson R800 printer (frame not included). We will draw a random name on Friday 10th June from those who have uploaded into the Week 22 folder by that date. So you have two weeks to complete the challenge. Now it’s time to draw a name from the photos loaded up into the Week 20 photo album. Today’s lucky winner is Anne Boorman Spiteri. Congratulations Anne! Here is the page that Anne created about Wonder. Todays quote is all about ABUNDANCE and how we can live an abundant life by living with gratitude. Gratitude is the key to our experience of abundance. When we are grateful, we give thanks for what we already have in our lives instead of dwelling on what we don’t have. We celebrate the beauty that exists in our life and appreciate the love and the support that is here for us. If we focus on what good is already present then it will increase and intensify. I truly believe that being grateful for everything we already have in our lives creates an abundant life in all ways. That gratitude attracts more things to be grateful for. What are you grateful for today? Use sheet music somewhere on your page. I created this page after watching one of the design team videos on our blog which was created by the lovely Monika Dabrowska-Ejmont who we featured a couple of weeks ago. Instead of a feature artist this week I have decided to flood you with alternative inspiration by linking some of my favourite artists on YouTube. There should be enough here to get your creative juices flowing! For this week’s challenge prize we have another lovely collection of books donated by the gorgeous people at www.compendium.com.au. They are the sweetest books and full of inspiration. We will draw a random name on Friday 3rd June from those who have uploaded into the Week 21 folder by that date. So you have two weeks to complete the challenge. Now it’s time to draw a name from the photos loaded up into the Week 19 photo album. Today’s lucky winner is Elizabeth Naisbitt‎. Congratulations Elizabeth! Here is the page that Elizabeth created about BALANCE. Hi there, this month I have done a very quick and easy art journal spread. There is nothing more therapeutic than starting a project with no intentions of where you want it to go. Just get messy and keep on adding a different element as you go. That’s exactly how these art journal pages came about. I find this to be the best way to create something when you have lost your “mojo” and you just need to get back into it. Unfortunately my time does not always allow for as much creating as I would like (how dare life get in the way of creating lol) and I find if I have a break for too long this is exactly where I end up. 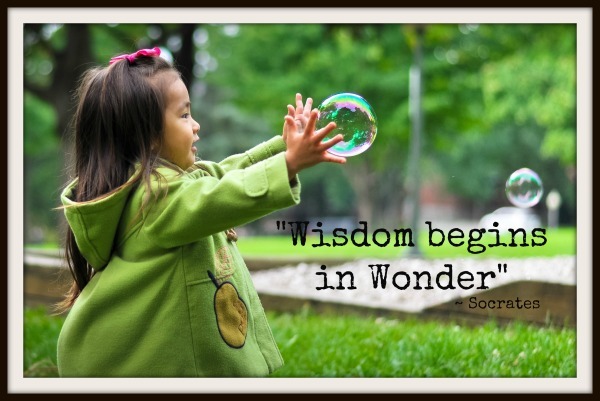 Today’s quote is all about WONDER. I chose this weeks quote as it reminds me of our feature artist this week, Tracy Verdugo. Make sure you read all about Tracy and her gorgeous art below. The most meaningful journeys are the ones that spark within us a deep sense of awe, gratitude and wonder! Use bubbles somewhere on your page. I love this quote and love to look at life with eyes of wonder. I used a lot of layering on this page as well as a little stamping to break things up. If Tracy Verdugo was given the opportunity to coin a term for a new art movement based around what she teaches she might call it “Curiosity and Wonderism”or maybe “Loosen-upism” or “Endless possibilitism”. Mostly though she is mama bear to two gorgeous, zest-filled daughters, Santana and Sienna, and co-adventurer in life with her amor of 30 years, the talented and brilliant Marco. The World in her Hands – a work inspired by Tracey’s favourite quote. Tracy is inspired by morning sea breezes and butterflies flitting by, salty air and the smell of coffee, colours and cultures and everything in between, humanity, compassion, simplicity, love. For this week’s challenge prize we are giving away a lovely collection of books donated by www.compendium.com.au. They are the sweetest books and full of inspiration. We will draw a random name on Friday 27th May from those who have uploaded into the Week 20 folder by that date. So you have two weeks to complete the challenge. Now it’s time to draw a name from the photos loaded up into the Week 18 photo album. Today’s lucky winner is Carrie Lynn Cordero. Congratulations Carrie! Here is the page that Carrie created about art healing. This week is all about having BALANCE is in your life. Use a feather somewhere on your page. My journal page about balance. I am inspired by nature and European folk art: paintings, sculptures, embroidery, artistic paper cutting. All that vibrant colours, patterns, flowers are making me happy. I am also so excited to be teaching a class at the amazing Australian Mixed Media Roadshow when it is in Sydney in July this year. Make sure you check out my class and what else this fun retreat has in store! For this week’s challenge prize Monika has donated a really sweet 6×6 sized canvas. We will draw a random name on Friday 20th May from those who have uploaded into the Week 19 folder by that date. So you have two weeks to complete the challenge. Now it’s time to draw a name from the photos loaded up into the Week 17 photo album. Today’s lucky winner is Karyn Niin Kitigade‎. Congratulations Karyn! Here is the page that Karyn created about FRIENDSHIP and finding your tribe. All you lovely Australians that are participating in the challenge are entitled to a 5% discount whenever you make a purchase from our Lulu Art store anytime throughout the year. All you need to do is enter in the following coupon code in when you check out – CMP2016 and your discount will be applied.